My dear French friend hosted a house-warming party before which we spent the better part of the day preparing a slew of appetizers. Good thing we all like cooking! 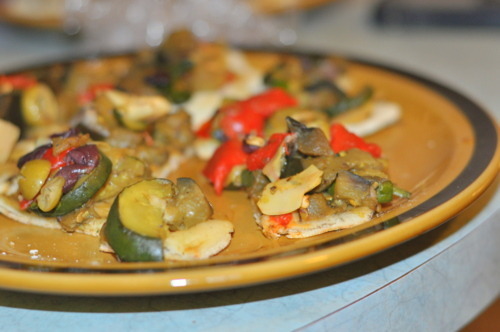 We started with some homemade pizza with sauteed vegetables and (?!) anchovies! I’m sure most of the guests didn’t realize there were anchovies on the pizza - it’s the kind of food growing up we all thought was so strange and icky - but hey it tasted really good, especially with the mushrooms and olives. 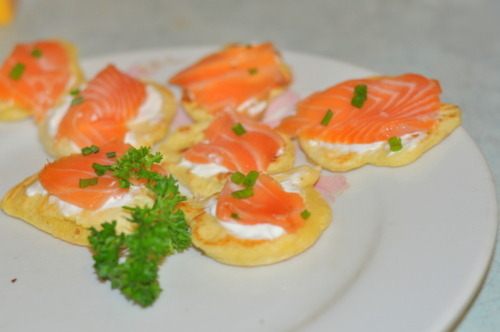 Next we made some blinis from scratch and topped it with smoked salmon, sour cream and chives. At first I thought Frenchie was making up the word “blini” but after our party I was watching and episode of Anthony Bourdain (great show for travel-loving foodies by the way!) he actually mentioned blinis! It’s funny things work sometimes! 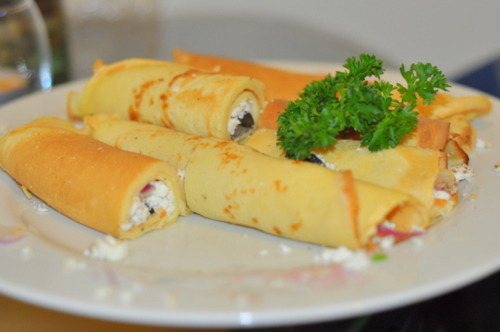 Next we made some savory crepes (Frenchie let me make a few! they’re pretty easy, you just have to get the hang of how much batter to add to the pan). The were stuffed with feta, red onion, olives and zaatar - a Lebanese mix of herbs - I also thought she was making this up until I saw it in a Lebanese restaurant in Ottawa! We also made some bacon-wrapped prunes. 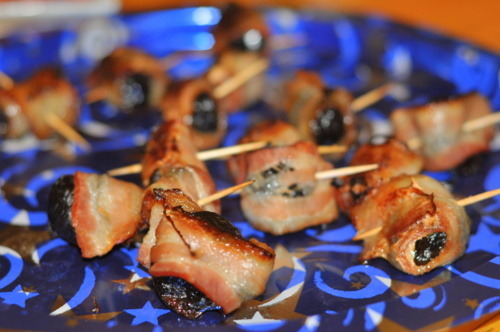 Such an easy and tasty appetizer - just wrap prunes with bacon and bake! Yum! To top it off Frenchie let us try some Vouvray wine from her home region in France! What’s your favourite homemade appetizer?